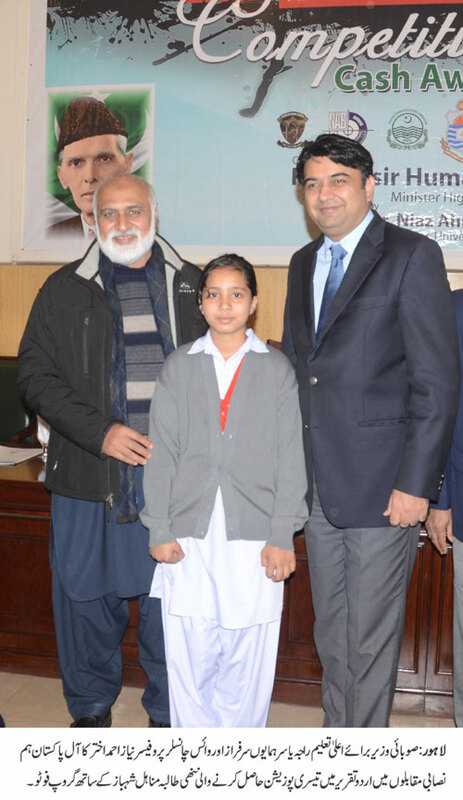 LAHORE: (Friday, January 18, 2019): Punjab Minister for Higher Education Raja Yasir Humayun has said that co-curricular activities are necessary for polishing leadership and creative skills among children and young students. He said that our education system must have the capacity to improve different skills among students along with imparting quality education. He was addressing prize distribution ceremony of 2nd The Educationist All Pakistan Co-curricular Competitions 2018 at Al-Raazi Hall here on Friday. The competitions were jointly organized by Punjab University, PHEC, The Educationist and NAB Lahore. Addressing the ceremony, Raja Yasir Humayun said that personality development was important part of education. He said that an educated nation could take better decisions regarding their future. He said that Pakistan’s future was bright and our nation was now on right direction. He said that the government was focusing on improving standard of degrees and graduates. He said that the government was making policies and taking initiatives to provide excellent human resource in all the fields according to modern requirements of the industry. Appreciating the organizers of co-curricular competitions, the minister stated that the platform had provided an opportunity to students from all the provinces to interact with each other. Addressing the ceremony, Prof Niaz Ahmad said that PU would extend support to the government for improving quality of education in Pakistan. He said that PU was preparing economic and education policies which would be provided to the government soon in order to cope with economic and academic issues. He said that every organ of Pakistan was performing and contributing to country’s development. He said that our forces and citizens had made great sacrifices in war on terror and achieved success. He said that in 2018, PU gave a direction to ensure good governance, merit, transparency, accountability and equality in the country and now in 2019, PU was suggesting to introduce National Action Plan-style reforms in education sector. He said that there was need to impose emergency in education sector because country’s development was linked to education. He said that PU would extend full support to promote co-curricular activities. Addressing the ceremony, Prof Dr Shafiq Jullandhry said that co-curricular activities were source of promoting civilization among new generation. He appreciated the minister on taking initiatives for the welfare of youth and utilizing their energies in positive activities. Mr Shabbir Sarwar said that the competitions were not possible without the support of PU Vice Chancellor Prof Niaz Ahmad. Later, the minister distributed cash prizes among winners. 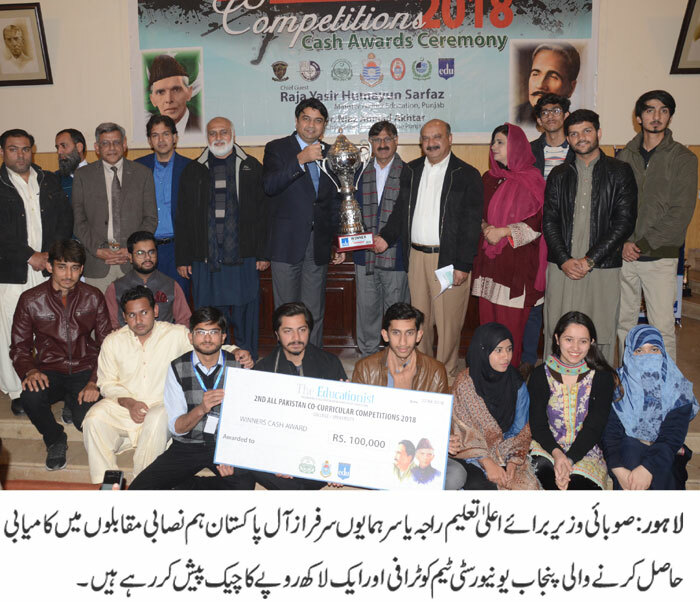 As many as 350 institutions and 1500 players from school, colleges and universities of Giligit Baltistan, Kashmir, Khyber Pakhtunkhwa, Balochistan and Punjab participated in the competitions which continued for five days. 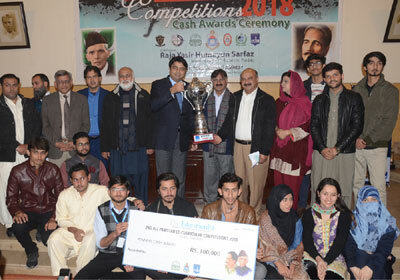 Punjab University clinched team trophy and Rs 100,000 cash award in universities/colleges category while The Punjab School and Garrison Academy Sarwar Shaheed Campus were in tie to share an equal cash award and team trophy. After the 5-day long competitions in 48 event categories, GCU Lahore and GCU Faisalabad shared the 2nd position and Rs 50,000 cash award. 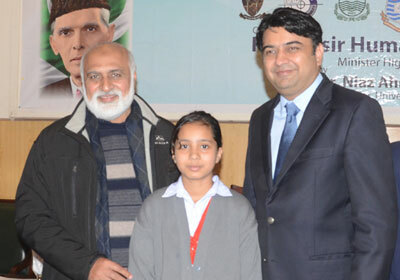 Minahil Shahbaz got 3rd position in Urdu declamation contest representing The Land Half School System. In schools category, Wapda High Schools Shalamar and Daanish School Boys Chishtian obtained 2nd and 3rd positions respectively.